Most of us use applications of the quantum world every day. Lasers in barcode scanners or laser cutters are monochromatic (single-color). This is a result Max Planck's realization that atomic energy levels are discrete; excited electrons emit photons at specified wavelengths, which correspond to the color of the laser. We also use foundations from quantum mechanics to keep track of time. Using atomic clocks, the National Institute of Standards and Technology and the Naval Research Observatory keep track of time in the US. You probably use atomic clocks as well; each of the GPS satellites in orbit carry 4 atomic clocks on board that help keep track of your location. But these technologies are not the subject of scientific debate. While many scientists are busy applying quantum theory to develop quantum computers and unsolvable secret messages, others are questioning what quantum theory means to our perception of reality itself. 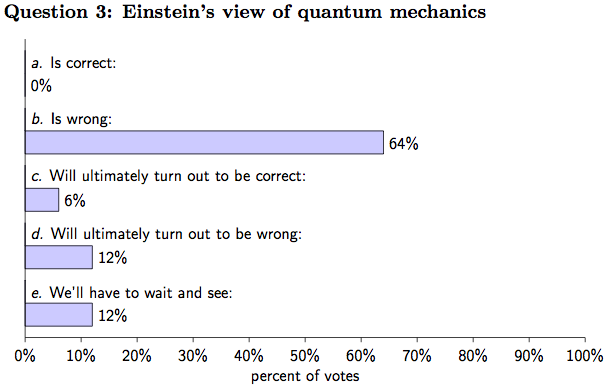 These are the questions about which Einstein declared, "the more success the quantum theory has, the sillier it looks,"and which Zeilinger posed to his colleagues last summer. 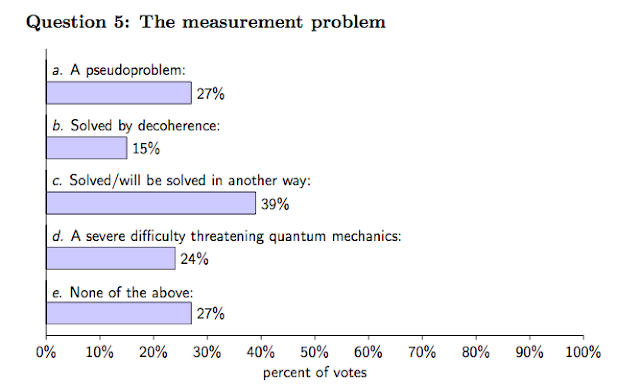 Some of the questions dealt with the nature of "random" physical processes and the meaning of the oft-deliberated wave-particle duality. Zeilinger and his colleagues on the paper write that it was noteworthy that this problem with how to make quantum mechanical measurements, "often portrayed as the main stumbling block for quantum theory," was only thought of as a "severe difficulty" by a quarter of respondents. Other questions got right down to the teams first posited in the quantum debates of the early 20th century: Einstein vs. Bohr. And one favorite: when asked "How often have you switched to a different interpretation?," one author wrote-in that (s)he "sometimes switches interpretation several times a day"! 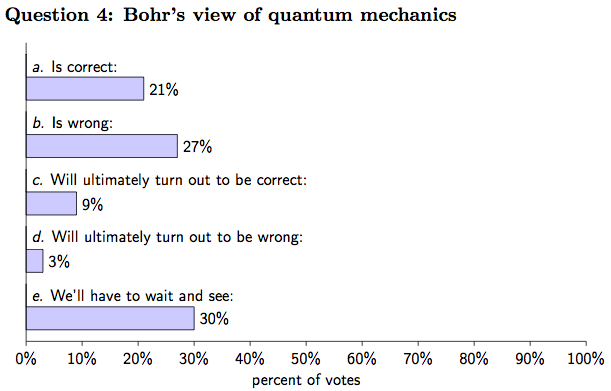 Zeilinger and his colleagues also included questions that probed how the scientists deliberated the debates in quantum mechanics, asking to what extent their "choice of interpretation was a matter of personal philosophical prejudice." 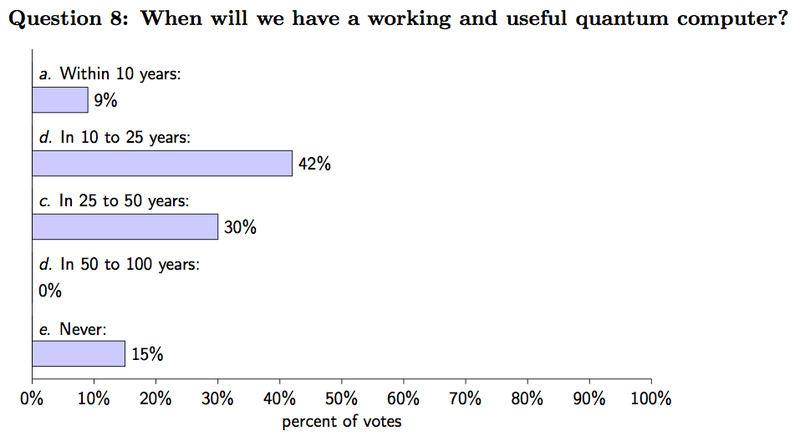 It may be surprising for a scientific debate, but 58% responded "a lot." In addition to the 16 questions on the poll, the scientists also mapped correlations between answers and identified a set of nine statements that were widely held (checked by more than half of the participants). Their results are published on the arXiv. 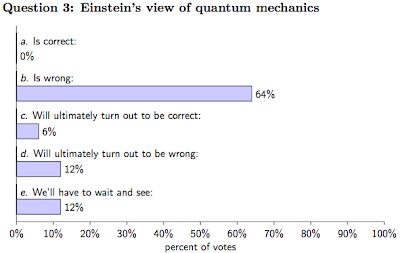 It isn't surprising to me that 33 quantum Physicists could not reach a concensus on the Nature of Reality, since reality is observer created and thus we have 33 different interpretations. Please watch for a more detailed explaination in my book "OCR Observer Created Reality" available on Amazon.com in early November. Or you may contact me, Eric Stilson at estilson@stilson-stilson.com. For me, the nature of reality is that it has no true boundaries or categories, always has energy, and can just as easily be considered as alive and animated as any life on all levels. I am a pantheistic atheist, in that I consider all consciousnesses as possessed by the universe, yet the universe obeys these while deciding their will.